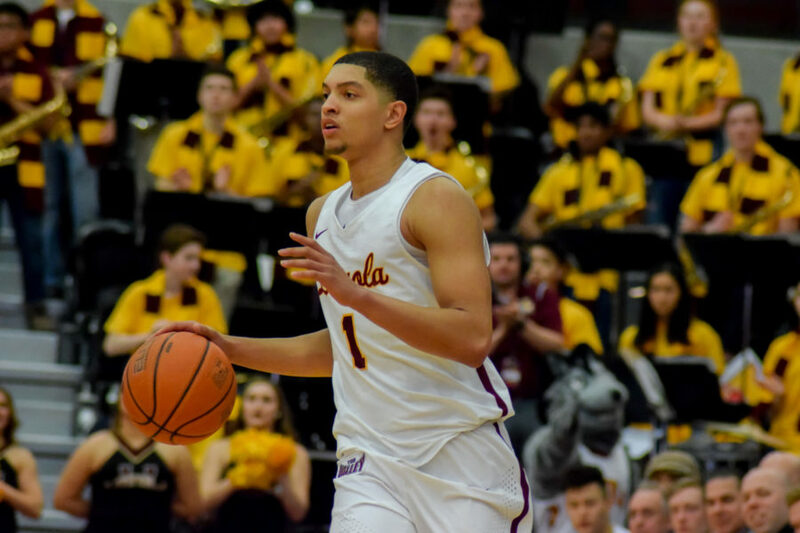 Tim Edmonds | The Phoenix Loyola sophomore guard Cooper Kaifes was one of six Ramblers in double figures as they rolled past Valparaiso 71-54 Jan. 15. 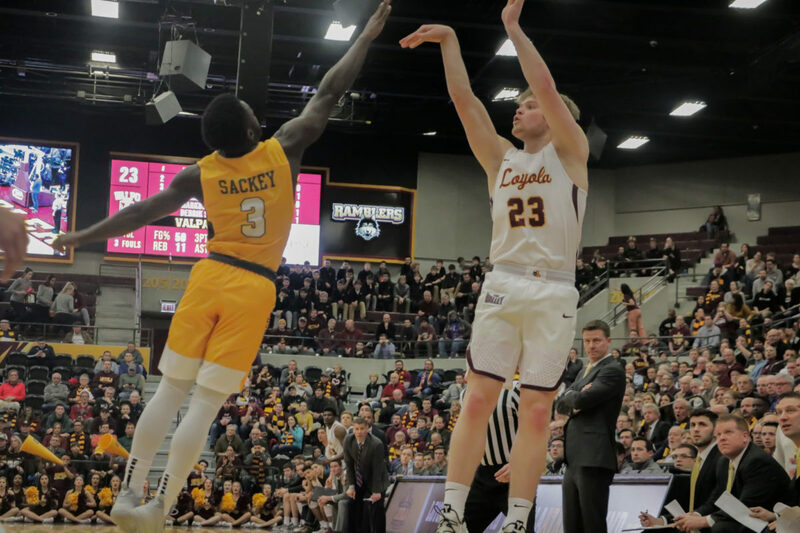 The Loyola men’s basketball team (11-7, 4-1) moved into a tie for first place in the Missouri Valley Conference (MVC) after a big 71-54 victory over Valparaiso University at Gentile Arena Jan. 15. The Ramblers had six players score in double figures for the first time since Feb. 3, 2018. Redshirt sophomore guard Aher Uguak, sophomore center Cameron Krutwig and first-year guard Cooper Kaifes each had 12 points, while redshirt senior guards Clayton Custer and Marques Townes finished with 11 points apiece. Sophomore guard Lucas Williamson also finished with 11 points while grabbing a game-high seven rebounds. This was Williamson’s third game back after he missed six games due to a broken hand. Head coach Porter Moser said this was Williamson’s best game since he returned. Nick Schultz | The Phoenix Loyola sophomore guard Lucas Williamson had 11 points and seven rebounds in the win over Valparaiso Jan. 15. After the game, Williamson talked about staying confident despite not playing his best basketball in the first two games since returning from his injury. As a team, Loyola shot 53.3 percent from the field and 8-for-15 from three-point territory. The Ramblers also shot 78.9 percent on free throws, significantly up from their 64.4 percent season average coming into the game. Valparaiso went into the match-up alone atop the MVC standings with a perfect 4-0 conference record and 11-6 overall. Although the Crusaders were on a five-game win streak, Loyola still had the better NCAA Evaluation Tool ranking — the Ramblers came in at 118th while the Crusaders were 171st out of 353 Division I teams. On defense, Loyola held the Crusaders to just 43.3 percent shooting and 6-for-18 from three-point territory. The Ramblers also forced 14 turnovers and scored 23 points off those miscues. Valparaiso only scored eight points off Loyola’s 11 turnovers. Loyola carried a 10-point lead into halftime, but expanded its lead with a 15-1 run to start the second half. Uguak said Moser’s halftime message was to continue to play with the same intensity in the final 20 minutes. Loyola is next scheduled to travel to Terre Haute, Indiana to face Indiana State University Jan. 19. Tip-off is scheduled for 1 p.m. and the game will be broadcasted on ESPNU.